Oval Chainring Part 2. Now with more science. – "Faster You Fool"
Oval Chainring Part 2. Now with more science. Hypothesis 1 : The oval chainring lowers heart rate for same power. Method: Get my MTB cranks, put them on my road bike, which also has a PowerTap Hub. Using the power tap takes out the problem the potential Stages ‘misreading’. Put bike on turbo trainer. Ride at set power (PowerTap) for 5 minutes. See what the heart rate settles down to for the final 2 minutes of that. Standardise cadence (95RPM) and Power (250W on PTap) Compare data for round vs oval. I did 2 runs with the oval, then 2 runs with the round, then another one at the end with the oval to account some for HR drift over the course of the test. Hypothesis 2: The Stages Power Crank reads different with a round vs oval ring? If so, how much? Method: Same bike setup. Standardise power on Powertap at 250W at 95RPM. Oval ring only. Leave the bike the same state but change data input to Stages instead. Compare power at same RPM. I’m gonna say thats another reasonably good piece of evidence, and it’s also in line with the real world results yesterday. As mentioned above, I did a direct comparison with the PowerTap, which measures power at the rear hub, versus the Stages which measures it at the crank. The Stages people say that if you use an oval ring the change in crank velocity over the stroke ends up reducing the wattage you see on your device. For now, I’m keeping it on. I did my first ride in anger on the weekend on the squishy ring. No.1 it really seems to be much smoother smashing it out of the saddle. You seem to be able grind better out of ‘over geared’ situations – you know how you find yourself in too big a gear for the pinch climb? Yeah, it helps with that. Also sprinting out of the saddle is smoother. I’m actually pretty convinced at this point that my initial finding was correct – i.e. that the device UNDER reads by about 5% – not OVER. Yes, I know thats different to what Stages claims but what can I say? 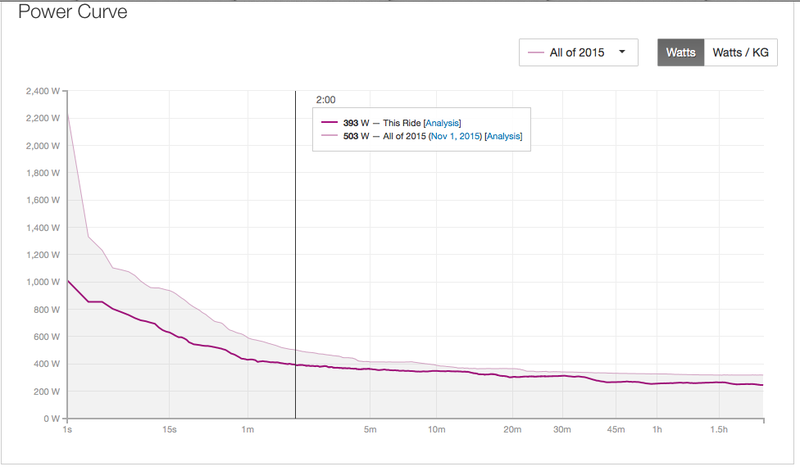 Check out the power curve from the weekend race. I know from quite a bit of other data that I’m pushing pretty good 2 min power numbers at the moment. The weekend race had some decent climbing so the 2 min power numbers should be pretty representative, and should be roughly PB’s. I don’t know whats going on there. Is it possible that the AB ring has a different effect on the Stages meter because of its profile vs Q rings etc? Is it an artefact of the higher torque/ lower crank velocities in mtb versus road? I dunno, but I think the data is pretty clear to this point. Previous Post Elliptical Chainrings on MTB. Testing the Absolute Black Elliptical Ring.